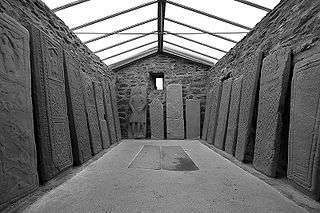 A famous khachkar at Goshavank Armenia. The oldest known works of representational art are stone carvings. Often marks carved into rock or petroglyphs will survive where painted work will not. Prehistoric Venus figurines such as the Venus of Berekhat Ram may be as old as 800,000 years, and are carved in stones such as tuff and limestone. These earliest examples of stone carving are the result of hitting or scratching a softer stone with a harder one, although sometimes more resilient materials such as antlers are known to have been used for relatively soft stone. Another early technique was to use an abrasive that was rubbed on the stone to remove the unwanted area. 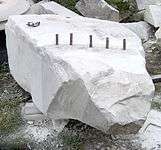 Prior to the discovery of steel by any culture, all stone carving was carried out by using an abrasion technique, following rough hewing of the stone block using hammers. The reason for this is that bronze, the hardest available metal until steel, is not hard enough to work any but the softest stone. The Ancient Greeks used the ductility of bronze to trap small granules of carborundum, that are naturally occurring on the island of Milos, thus making a very efficient file for abrading the stone. 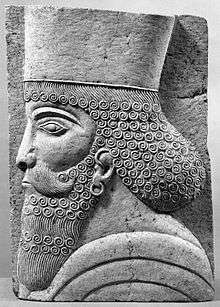 Bas-Relief, late 19th century CE. Limestone. Brooklyn Museum. Carving stone into sculpture is an activity older than civilization itself. Prehistoric sculptures were usually human forms, such as the Venus of Willendorf and the faceless statues of the Cycladic cultures of ancient Greece. Later cultures devised animal, human-animal and abstract forms in stone. The earliest cultures used abrasive techniques, and modern technology employs pneumatic hammers and other devices. 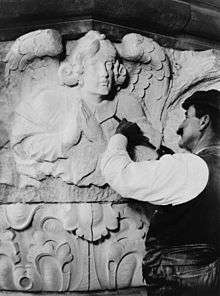 But for most of human history, sculptors used hammer and chisel as the basic tools for carving stone. 'Arabic' style carving on ashlar building blocks, Beith, Scotland. Pitching tool used in preliminary rough shaping blocks of stone. Carved flower on stone, ancient work, Archaeological museum of Jaffna, Sri Lanka.